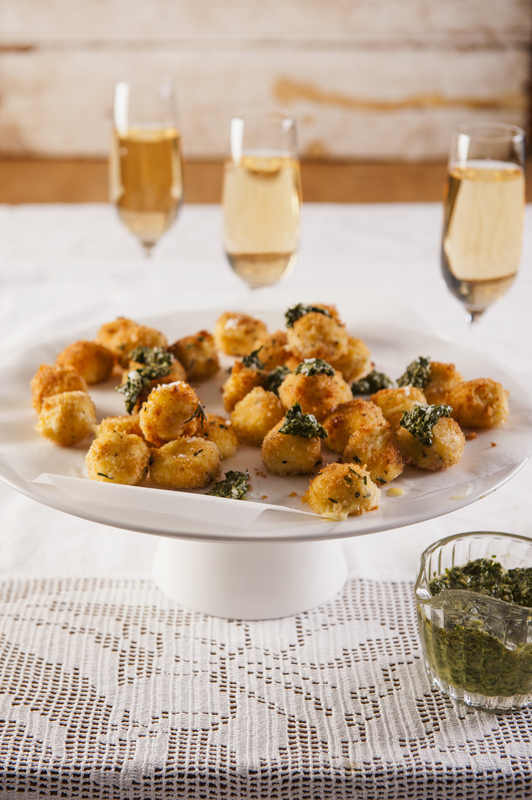 A party favourite – because who can resist fried cheese? 1 To prepare the breadcrumbs, place bread pieces in a food processor, and pulse until you have about 2 cups of coarse bread crumbs. Stir in rosemary and garlic. Season with sea salt and cracked black pepper. 2 Dip bocconcini balls in whole wheat flour, shake off excess. Then dip into egg, and finally coat in seasoned ciabatta bread crumbs. Place on a tray; set aside in the freezer for a few minutes while you make the pesto. 3 To make the pesto, remove the basil leaves from the stalks. Place leaves into the food processor with the other pesto ingredients and puree with enough extra virgin olive oil to make a smooth consistency paste. Season to taste. 4 Remove bocconcini balls from the freezer. To cook the bocconcini bites, pour 3 centimetres of extra-virgin olive oil into a large frypan and heat on medium-high. Sauté a few bocconcini at a time for 3 to 4 minutes, until golden brown and cheese is just beginning to melt. Drain on paper towels. Serve with pesto as a dip or topping.